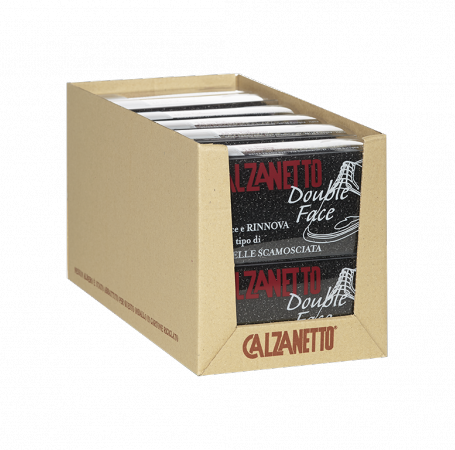 The new Calzanetto Suede Double Face removes dust and fouling from suede of various types, lifts hairs and, if used regularly, it returns to the treated surface the colorand appearance of the original. This product is also available in brown, neutral, black and for impregnated leather and skins. Switch the towel in favor of the hair and also gently in the opposite direction. Thepressure required must be commensurate with the type of suede and dirt from time to time present. 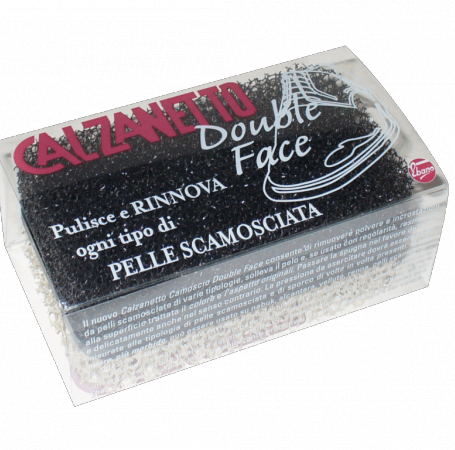 The dark side, softer, can be used on nubuck, alcantara, velvet, suede,suede delicate. The light side, rougher, on crust or suedes resistant or to removestubborn deposits. Washable, as the need arises, with warm water and mild soap. It is recommended to complete the trattametno with Ebony Waterproof Spraywaterproofing protective, neutral or renovator of color. Do not use on smooth skin, leather and delicate skin. If it used regularly returns to the treated surface the color and appearance of the original, removing dust and fouling from suede leather.